Georgia State University J. Mack Robinson Executive MBA Alumni! We, the EMBA Alumni Board, support the pursuit of enhancing the value of your Robinson EMBA degree by providing access to programs and tools that will strengthen your career and support your mission of continued personal and professional development achieved through a lifetime of learning. This website is maintained by the EMBA Alumni Club as a platform of value that supports alumni and program communications, the exchange of ideas and experiences, access to continued education and career development, and connects you to the EMBA Alumni network. Welcome and we look forward to seeing you at an upcoming Alumni Club event. 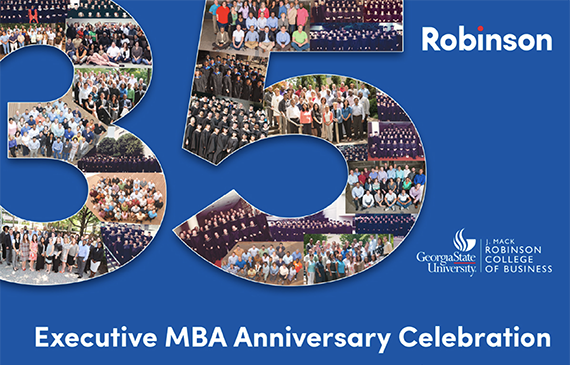 As an alumnus of the Robinson EMBA program, you are already among an illustrious membership of more than 1,400 graduates spanning over 35 years of cohorts, holding leadership positions worldwide. Our EMBA Alumni network serves to foster professional and personal growth, strengthen members' networks, and promote the value of Robinson's Executive MBA. The network focuses on maintaining an engaged, supportive, and loyal resource for EMBA alums. The Board of Directors plans events throughout the year and members can participate at reduced fee or no cost. Annual membership is just $40, ROI achieved in two events or less. * Leadership Exchange - Mentor a new EMBA student. * Executive Crunch - Get updated MBA content in a "crunch", short-session format. * Junior Achievement - Inspire young people to succeed in a global economy. Register today to become a supporting EMBA Alumni Club member. If you're not already a member, Signup Now or visit the Benefits page to Learn More. All new accounts will be verified and approved prior to any charges being processed. Let’s Raise 35K for 35 Years! All proceeds and donations will go to the GSU Foundation in an account to provide support for the EMBA program and scholarships for EMBA students. If the funds reach $35K, they will be used to create an endowment for the program. If you've previously registered, please click the "Member Log-In" link to access your account. You can change your password and an email will be generated and sent to the address on file. If you do not receive an email, please CONTACT the Communications Committee for assistance.